FRONT ROYAL WOMEN’S RESOURCE CENTER AND ROYAL OAK BOOKSHOP co-sponsor donations to Samuels Public Library that are by or about women. This book is now available to be checked out. In a secondhand vehicle she christens “Van Halen,” Jessica Bruder hits the road to get to know her subjects more intimately. Accompanying her sixty-four year old protagonist, Linda May, and others, from campground toilet cleaning to warehouse product scanning to desert reunions, then moving on to the dangerous work of beet harvesting, Bruder tells a compelling eye-opening tale of the dark underbelly of the American economy – one that foreshadows the precarious future than may await many more of us. At the same time, she celebrates the exceptional resilience and creativity of these quintessential Americans who have given up ordinary rootedness to survive. Like Linda May, who dreams of finding land on which to build her own sustainable “Earthship” home, they have not given up hope. Nomadland is a deeply engaging and disturbing book that is also a joy to read. A package from Amazon will never look the same again and the next time you stay at a National Forest campground, you will look at the Camp Host with very different eyes. 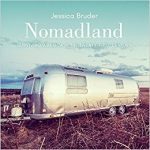 Jessica Bruder is an award-winning journalist whose work focuses on subcultures and the dark corners of the economy. She has written for Harper’s, the New York Times, and the Washington Post. Bruder teaches at the Columbia University Graduate School of Journalism.